One concern that opponents of the T-Mobile-Sprint merger have is that the deal could lead to increased prices for consumers. Today T-Mobile and CEO John Legere submitted letters to the FCC to make a pledge that prices won’t go up. New T-Mobile has committed to offering the same or better rate plans as those offered by T-Mobile or Sprint as of today’s date for three years following the merger. “We are the Un-carrier. If we broke faith by raising rates and cutting back benefits, we would lose our loyal customers and destroy the future of our brand,” said Legere. “I want to assure you that we would never do this. T-Mobile explains that T-Mo and Sprint legacy plans will continue as New T-Mobile plans for three years after the merger or until better plans that offer a lower price or more data are available, whichever happens first. When arguing in favor of their merger, T-Mobile and Sprint have previously said that their deal will enable them to deploy a “world-class 5G network” with lower marginal costs per subscriber, which will result in customers getting better coverage and more data at the same or lower prices. T-Mo and Sprint also believe that their merger will force competitive responses from AT&T and Verizon that will result in a decrease in the price per gigabyte of data for consumers. Meanwhile, opponents of the deal have said that we’re more likely to see better innovation and price competition with four carriers. The proposed merger of T-Mobile and Sprint is under review by the FCC and U.S. Department of Justice. The two carriers have said that they expect the deal to be completed in the first half of 2019. Well first, inflation – I think in general the mobile companies have bottomed out on prices, and are now going to increase about 2% a year to cover inflation. Second, I believe the older services will be priced the same, the new ones will be at higher prices but will provide more value. As an example Tmobile One is more expensive than the 5meg data cap plan it replaced, however I am on Tmobile One because now I can wantonly use data on my phone without having to worry about exceeding limits (when I am in an area that actually has Tmobile service). I suspect the 5g plans will cost more – and will provide considerably more benefit to the consumers. But I also suspect Tmobile will keep the 4g plans the same price. Netflix is doing something similar. They have the standard def plan the hi res plan and the 4K plan. The 4K plan is about 4 bucks more a month, but Netflix is finding, just through normal attrition, as folks purchase 4K TV’s they voluntarily go to the higher plans – meaning Netflix will not have to raise prices as often. None of the majors have reasonable postpaid one-line plans. Even the prepaid one-line plans aren’t necessarily all that great, the action in prepaid is also in multi-line plans. I find it beyond stupid that Apple’s phone financing plans require a postpaid line. HUH? How many single line unlimited plans cost $50 or less? Metro, Cricket, Boost, Simple Mobile, Straight Talk, Comcast, Charter, the list goes on and on. As far as Apple phone financing, there are a lot of ways to finance a phone at no interest. You just listed all MVNOs with prepaid plans – including ones that run on T-Mobile’s own network already, such as the T-Mobile-owned Metro. randian’s statement that none of the majors have reasonable postpaid single line plans – assuming “majors” equates to postpaid service directly on a big four carrier – is accurate. I also find it annoying that Apple’s Upgrade Program won’t work on a SIM-free phone and requires a postpaid plan. BS! , Mr. Legere stop lying, history is against you, there is not one company who after a big merger the customers have gotten better service and cheaper prices. The only ones who get their pockets lined are the investors no one else. Hmm are you sure about that – I would just have to find one example to counter you. So, why don’t you become an investor? Mergers there greatly reduced the cost of flying. In fact. Flying is now far more accessible and far, far cheaper than it was decades ago. Flying used to ONLY be the purview of the ultra wealthy and well to do. Now I can easily find airfare from Chicago to Florida for less than $100. You can go even cheaper than that if you are willing to make concessions. As a total dollar amount a ticket may cost more than it did in 1965 but as a percentage of income and affordability it is greatly reduced. There is a list of 544 different airlines that no longer exist in the United states. There are currently 11 operating airline companies in the US. If you count the airlines that actually service the majority of the country (ala AT&T/VZ) there are 6. One could easily claim that that is a reduction in competition. I beg to differ. customer service has suffered. My mom has worked for over 20 yrs with an airline that was merged with another. The former airline usually had good review and service. The new combined company doesn’t as much. In fact, they closed the reservation center in town, told employees they can either work at another city’s center, or work from home for a 20% pay cut. Fares might have been expensive as services were greatly increased. Now you can get rock bottom prices, but nickled and dimed for everything. No more warm meals, you are lucky to get chips. planes also have become more efficient, thus lower fuel costs. You also can’t equate its cheaper because as a percentage of income is reduced. Wages have gone up since the 60s, but so has everything else. CS may have decreased. But availability, cost, access, choice have all increased to the benefit of the customer. Thank you for some sanity in this discussion. They will always change the goal posts. Here’s an idea, if you aren’t happy with TMO, post-merger, go to another carrier. I wish people felt the same anger about getting screwed by the Fed govt. Availability/choice/access has not increased. Several options for flights i’ve personally been on have been cancelled. Now there is one non stop flight when there were 3. AT&T and Bell South. In the bad old days of DSL internet you paid $75 per month for painfully slow service. Today you put AT&T vs. the cable company and walk away with $30 service locked in for a year or two. Wash, rinse, repeat. What happens if they follow through with a legitimate home broadband option so now we have 5 options in most markets instead of 2? Humm Three years on the Sprint $15 Kickstart Unlimited plan, oh im in. Don’t believe prices won’t increase. Look at at&t and their mergers, they increased prices and increased prices to cover the debt from the purchase of the companies. There is really no benefits for customer for this merger. 5g will be deployed whether there is a merger. And AT&T is losing customers like mad and are now experiencing severe money problems because of it. They will back down. AT&T or Verizon losing substantial subscribers will lead to a price war. At least initially pricing doesn’t need to be a concern. The concern should be what happens when the 3 carriers are just trading a few hundred thousand subs every quarter. Nothing different than the current four. There are a few good examples. Pixar and Disney – not only didn’t “movie prices go up” but Pixar was able to produce twice as many movies per year, Disney greatly expanded the animated movie production, and Pixar also benefited from being able to use Disney characters in the movies as well. We had less competition because a movie studio was swallowed up and yet we get twice the movies! Interesting. There are few exceptions where mergers benefit consumers. In general, mergers are terrible for consumers. The film making companies can have many competitions and new film making companies can be established much easier than wireless companies. Due to the limitations of spectrum, especially the scarcity of low band spectrum, and few spectrum auctions available from government, new formation of wireless carrier is very difficult. Also, getting headset manufactures to make headsets for a particular spectrum set is very difficult. Look at how much Sprint have to pay Apple for making a Sprint compatible iPhone. Good luck waiting for a new carrier to form. Instead of merger, T-Mobile should use the money to spend on upcoming 24 GHz spectrum for 5g. It would be easy for this to be compared to other mergers, but it simply can’t be done. As long as T-Mobile, Verizon and AT&T continue to lease their spare capacity MVNO’s offer an alternative that other industries don’t have. I don’t buy prices significantly increasing as a result of this merger. The only flaw in that is that Disney/Pixar don’t set movie prices. A better analogy would be two movie theater chains merging and the effect of prices caused. Two studios merging only influences the quality/quantity of movies. They set the cost to purchase the movie streaming, Blu-ray, or DVD though. Those prices didn’t increase. Not really. If you look at all the movies released from all the different Studios, DVDs are generally the same amount. Streaming services also provide their movies for about the same price. If Disney and Pixar actually set the prices then there should be no differentiation between Target, or Best Buy or Amazon. They may have a wholesale cost for all of these vendors, but it is the vendor that actually determines what the price will be based on their own profit margin. Why is Amazon generally cheaper for items? Because they can sell so many more products in Mass quantity that’s lowering their price. only Apple products demand price points that everyone keeps. American Airlines is phasing out Gogo Inflight in favor of Viasat on many of their planes. I wonder if this will affect the T-Mobile plans. Only one less place you can use your benefits of being a T-Mobile customer. Shouldn’t be any changes other than that. T-Mobile’s acting like they can’t compete properly with the big two, yet they rake in most customers every quarter for the last few years. Slowly but surely they’re catching up. Sprint on the other hand…can’t catch up even giving away their network access to customers. Yes, and it’s why without T-Mobile buying Sprint now, eventually they’ll be broken up and sold to the highest bidder. John Legere used to be on the customers side but now since he is raking in more money, he’s acting like a bully & is money hungry than ever. I think where we’ll get screwed over on grandfathered plans is 5G. We’re not going to be getting full high speed unless you change rate plans or pay a premium. They’ll have a 4G legacy plan, and then 5G will see increased pricing, or a 5G fee. These big corporations make promises then break them once they get what they want. I don’t but anything they’re selling! Based off of all these responses it seems like you guys are all bitter about change. Statistically speaking the cost per gigabit has gone down YoY. By consolidating and leveraging one another spectrum they continue driving competition and reducing and enhancing the customer experience by providing more OPTIONS. 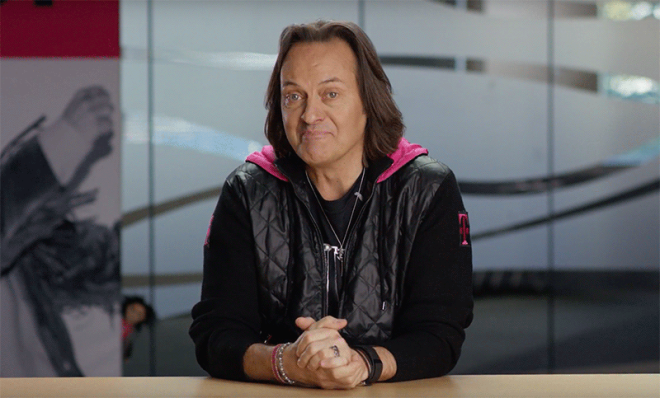 John Legere has worked well through his leaders to influence the wireless industry tremendously. Just recently I went the T-Mobile and Sprint merger public hearing and was able to hear both sides of the fence. I hope that you guys can look at things from different perspectives, short and long term. Ok, I admit it, I am bitter about change. Why shouldn’t I be. Since late 2016 the cost of a plan similar to mine has either gone up or become unavailable. Remember those of us that use hotspot for our home internet because the cable companies are MIA, our cost per gig has gone up not down, and that is if it has not been taken off the table completely. Only Sprint and Verizon have been making some attempts to expand hotspot, but even then with restrictions. I do not even want to speculate what things would be like if Sprint is allowed to merge with T-Mobile. Yes, I am rural, and yes Sprint works well here. With no cable alternative for internet access, I certainly do not want to go from four limited options to three even more limited and expensive alternatives for a service that one can no longer be without. Prices go up when mergers reduce competition. Anyone who believes I have a bridge to sell you. That said, data charges in the US are already much higher than Asia. If you stick with the 4G plan you can retain your legacy plan. If you want 5G a year from now, cough up the cash, so T-mobile can make up for the 25% of cash they will pay Mr. Son of Japanese Soft Bank company. I hope the FTC will not allow this merger and reduce already low competition in the US. FCC Commissioner Mr. Pai is compromised and is Trump’s hack man. I don’t see him standing up for consumers. Because a free market can only exist when there is no monopoly or concentration of market share. That is the role of Federal Trade commission (FTC) to ensure there is competition. If Sprint stock continues to go down a major international competitor will buy it. I suppose you know Sprint is currently majority owned by Softbank company of Japan and T-mobile by German Deutsche Telekom. There is no reason why the Japanese majority owned company will not be bought out by some other company such as from Mexico or Spain or even UK. So fear for bankruptcy of Sprint should not result in reducing competition in the US market. This merger will allow T-mobile to jack up 5G prices and AT&T and Verizon will be only too happy. Those who don’t want to pay higher prices can stay on 4G legacy network for the next decade. T-mobile is smartly only committing to keeping prices same for 4G network and not 5G. Their CEO is smart. But FTC will see through this charade. Fortunately Democrats now control the house and Trump’s crony capitalism might not work. They should have done this merger a year ago. I hate how people say the price structure will be different between 4G and 5G. Historically when has that happened? There is no option to only be connected to the 2G or 3G network. You think tmobile is going to offer two different “one” plans for different network technology? Thats too messy and wont work. Sprint tried something like that when 4G wimax came out and labeled it as a network “premium fee” and it came with major backlash. Will prices go up over time? Of course they will. They will go up regardless if tmobile merges with sprint or not. Sprint won’t go backrupted. They will sell to someone else before that happens. The best scenario for consumers and America would be SoftBank selling it to another player and not do any merger, except merging with dish network and their spectrum. If you don’t want the merger, have Dish start their own network and make more competition. John just said he won’t raise plan prices as phones switch to 5g. From 3G to 4G prices didn’t get worse. I get that lesser competition = high prices. But T-mobile has been good with grandfathering prices. Been with them for over 10 years, price hasn’t change except for taxes. I will give them the benefit of the doubt until otherwise.